(TORONTO) – Community and labour groups will hold “Peoples’ Hearings” on November 15 across Ontario, in protest of Ford government’s decision to limit Thursday’s Bill 47 hearing by the Standing Committee on Finance and Economic Affairs to a mere five hours. There is little opportunity for public input on Bill 47. This is in stark contrast to the 14 days of province-wide committee hearings the previous government held to discuss Bill 148, as well as the two-year long Changing Workplaces Review that preceded it. That review had involved 12 public consultations, 200 oral presentations, and nearly 600 written submissions. This rigorous process laid the foundation for the employment and labour law reforms that Ontarians currently benefit from. These are the very laws the Ford government seeks to undo with Bill 47. 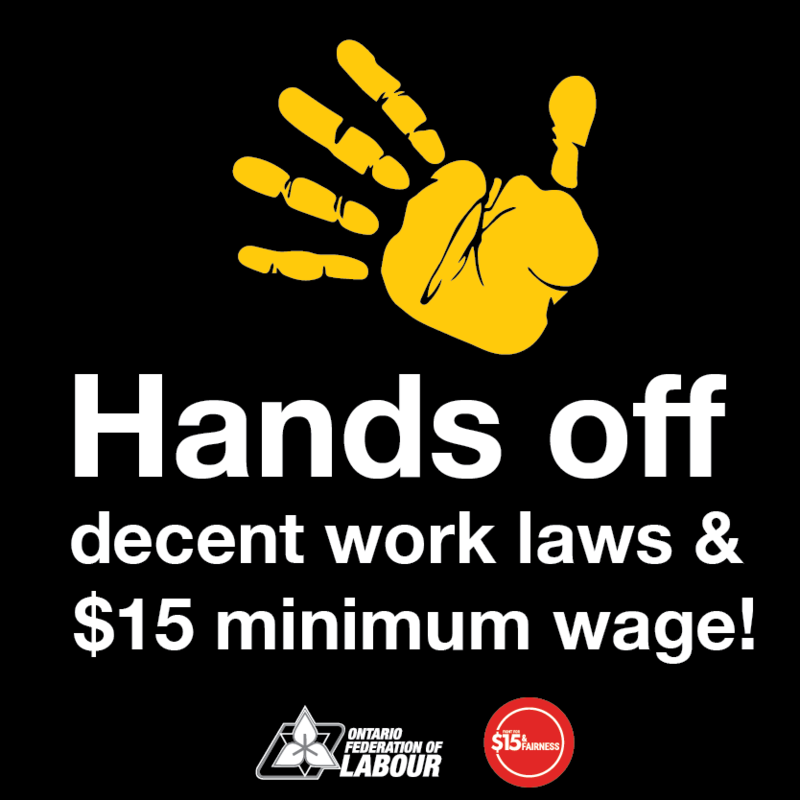 In addition to imposing a real dollar wage cut for Ontario’s lowest paid workers by delaying $15 to at least 2025, Bill 47 would also eliminate the two paid sick days, reduce the number of unpaid personal emergency leave days, lower fines for employers who break the law, scrap equal pay rules and make it easier for employers to fire workers who decline last minute shifts, and do away with measures that made it easier to join and keep a union. “It’s the beginning of the holiday season. What the lowest-wage earners in Ontario need is a $15 minimum wage on January 1, as scheduled, not an income tax cut that will do nothing for two-thirds of those earning the minimum wage,” said Pam Frache, Coordinator of Fight for $15 & Fairness Campaign. Brantford, Newmarket, Ottawa, Scarborough, St. Thomas and Toronto are some of the locations where local community and labour groups will be speaking out. See event details below. OTTAWA (Nepean), The Peoples’ Hearing on Bill 47: Speak out for fairness!